Stephen Joseph Harper was born on the 30th April 1959, in Toronto, Ontario, Canada, and is an entrepreneur and politician, who is best recognized for serving as the 22nd Prime Minister of Canada from 2006 to 2015. He was the head of the Canadian Alliance, later the leader of the modern Conservative Party of Canada and for being the first prime minister to come from that party. So, have you ever wondered how rich Stephen is, as of early 2017? According to authoritative sources, it has been estimated that the total size of Stephen’s net worth is over $7 million, accumulated through his successful career in politics, and as an entrepreneur. Stephen was born and raised in a middle class family. He attended Northlea Public School then John G. Althouse Middle School and Richview Collegiate Institute in Central Etobicoke. While he was in high school, he got interested in politics so joined the Young Liberals Club. Upon matriculation, he enrolled at the University of Toronto, but left after only two months, and moved to Alberta where he worked in the petroleum industry for three years before attending the University of Calgary, where he graduated with both BA and MBA degrees in Economics. While he was still at the university, he became a member of the Reform Party, and later the policy chief, and the next year ran for seat in the Canadian Parliament, but lost. Five years later he ran for the same seat again and won, which lead to him spending the next four years in opposition to the Liberal Party, which had won a majority. In 1997, he stepped down from Parliament to become vice president of the conservative activist group the National Citizens’ Coalition, and soon became its president. While he was on ‘vacation’ from Parliament, he changed his political strategy and realized that the Reform Party could never win a nationwide majority on its own, and its principles needed to be combined with the Progressive Conservatives. A few years later, he engineered such a merger, as he was elected to Parliament again, and became the official leader of the opposition. 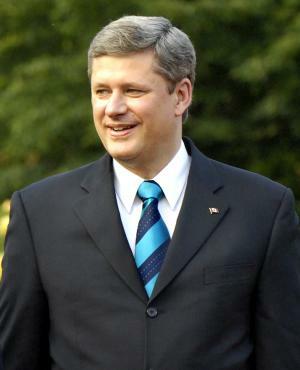 In 2003, Harper negotiated with the leader of the Progressive Conservatives to merge the two parties, co-founding the Conservative Party of Canada, of which he became head in 2004. In the national elections in 2004, Liberals won, but at the next elections the Conservatives won, but didn’t get a majority in Parliament, so Harper became the leader of a minority government. The neoconservative Harper government focused on enlarging the military, securing Arctic waters for their energy resources, and reducing taxes, which is given credit for steering the Canadian economy through the 2008 financial crisis. To speak about his recent career, he was ousted by a candidate from the Liberal Party at the national elections in 2015 due to a fraud scandal involving a member of his government and some other similar things. Harper retained his seat in the House of Commons, but resigned as Conservative leader, and became a backbencher. Thanks to his accomplishments in the politics, Stephen won a great number of awards, but some of the most impressive ones are Queen Elizabeth II Golden Jubilee Medal for Canada (2001) for being the leader of Her Majesty’s loyal opposition, Queen Elizabeth II Diamond Jubilee Medal for Canada (2012) for being the Prime Minister of Canada and member of the House of Commons of Canada, and in 2016 the president of Ukraine gave him the greatest award for foreigners – “Order of Liberty”. Speaking about his personal life, Stephen Harper has been married to Laureen Teskey since 1993; the couple has two children. Previously, he was in marriage to Neil Fenton from 1985 to 1988. He is known as a huge fan of ice hockey and of the Toronto Maple Leafs, and published the book “A Great Game: The Forgotten Leafs And The Rise Of Professional Hockey”, and still occasionally writes articles on the subject. His current residence is in Calgary, Alberta, Canada. 1 When making informal public visits, often wears no necktie with shirt and keeps jacket on during speech, with eyeglasses. 1 [on opposing Canadian party leaders, 2015] These guys just don't get it. We're living in a dangerous world. 2 [to Vladimir Putin at the G-20 conference in Brisbane, 2014] Well, I guess I'll shake your hand, but I only have one thing to say to you: You need to get out of Ukraine. 3 [observation 2000, on the recently deceased Pierre Trudeau, the former Prime Minister] [He created] huge deficits, a mammoth national debt, high taxes, bloated bureaucracy, rising unemployment, record inflation, curtailed trade and declining competitiveness.. Only a bastardized version of his unity vision remains and his other policies have been rejected and repealed by even his own Liberal Party.. He was also a member of the 'greatest generation', the one that defeated the Nazis in war and resolutely stood down the Soviets in the decades that followed. In those battles however, the ones that truly defined his century, Mr. Trudeau took a pass. 4 I think we all have more respect for those citizens who run for office to change politics, not to have politics change them. 5 I've only ever heard two criticisms of prime ministers. They're either too controlling, or they're not in control. Prime ministers who aren't in control don't last very long. 6 [on Alberta's behalf as president of the National Citizens' Coalition, National Post, January 24, 2001, "Open Letter to Ralph Klein"] It is imperative to take the initiative, to build firewalls around Alberta, to limit the extent to which an aggressive and hostile federal government can encroach upon legitimate provincial jurisdiction. 7 I tend to watch American news; I don't like to watch Canadian news and hear what Allan [Gregg, the pollster/CBC pundit seated in the audience] and everybody else is saying about me. 8 As long as there are exams, there will always be prayer in schools. 1 An avid hockey fan, Harper published a book on the topic while serving as Prime Minister. The book, titled "A Great Game: The Forgotten Leafs and the Rise of Professional Hockey"(2013), chronicles the growth of professional hockey, particularly in Toronto. 2 According to party literature, he is in the process of learning Spanish. 3 Born at 12:00 AM. 4 Prime Minister of Canada (2006-2015). 5 Leader of the Opposition in the Canadian House of Commons (2002-2004) and (2004-2006). 6 Leader of the Canadian Alliance Party (2002-2003). 7 Leader of the Conservative Party of Canada (2004-2015). 8 Dropped out of the University of Toronto after just two months. 9 Graduated from the University of Calgary with a Bachelor's Degree and a Master's Degree in Economics. 10 He is the first prime minister since Joe Clark not to have attended law school. 11 Children: Benjamin, born in 1996, and Rachel, born in 1999.